I like these very much. These are called Grissini, Italian crispy bread sticks. I first tried them in Kuala Lumpur in a high end restaurant. They serve this as appetizer. They are served exactly like these, in a tall glass, right smack at the centre of a round table. They are good to munch on just by itself or sometimes, I make these when I am having cream of mushroom soup for dinner. They act as a stirrer in my hot chocolate too. In that case, I would usually leave them plain. Here, I've used black sesame seeds, white sesame seeds, parsley, mixed herbs, oregano and thyme. I did not glaze them. I thought they look very good just by itself with no sheen whatsoever. I adapted the recipe from Agnes Chang book, I Can Bake. As silly as the title of the book may sound, I've made lots of breads and buns from this book and they all turn out very good. Agnes bakings are all typical things you would find in an Asian bread shop. I like them especially when I am here in Adelaide and things like chicken floss bun could cost 3 to 4 dollars just for one. Finally, I like this recipe because it does not call for much proofing time, though proofing it for 15mins or so helps a lot because when you roll them out into long sticks, it will not shrink back much. Here's the recipe and it is so so so, I cannot tell you how easy they are! Combine the liquids in a spouted cup and pour them into the flour mixture. Briefly knead with hands for 10mins or so until smooth and elastic. Cover dough with a damp, clean cloth and let it rest for 10 mins. Knead again for 10mins and divide them int 10g pieces. I yield about 22 pieces. Here, Agnes ask to roll them into long sticks but I cover these individual balls with damp cloth and let it rest another 15 mins. They don't shrink back at all when I roll them into longish shape after that. Your choice! After 15 mins, roll them into long sticks. The longer and thinner they are, the crispier they are so roll them long! Work with one stick at a time, covering the rest in damp cloth. When longish, scatter a little of your choice of scattering around the stick and roll the stick around to pick up the scatterings. If it doesn't stick, sprinkle a little water over the sticks but they usually stick very well. It won't take up much time really so repeat that 20 times and place them on a greased and floured tray, about 2cm apart. Bake them in a preheated oven at 200C for 15-20 mins until they are dry and golden brown. Remove from the oven and cool before serving. Easy and done! I can't seem to find any recipe that pairs the two together so I thought I'll do it. After all, why not? There is something very magical about cinnamon and Chai and they'll bring you to heaven when eaten together. This French Apple Tart, I make the pastry using wholemeal flour. Seeing the amount of butter that goes in, I thought we could all be a little more healthier and do without the frangipane cream seeing the amount of butter dotted over the tart before baking and the butter used in the pastry itself. But really, there can never be too much butter. I have used Alice Water's Pate Brisee here republished by Smitten Kitchen. I substituted wholemeal flour in place of flour and half the recipe given to fit my 8'' tart tin. I didn't go galette style because halving the recipe gives me just enough dough to line the sides and base of tart tin. I chop up 3 to 4 medium sized apples and arrange them in the tart tin. I then simply sprinkle over less than a tablespoon of sugar over the apples and crust. Dot lots of butter here and there and I've put in a pinch of cinnamon to bring out the flavour so it pair better with Chai Ice Cream. And the Chai Ice cream....what have I got to say really.... luscious, smooth, strong Chai tea flavour. Tea and sugar and spice is very, very nice...the Indians were onto a wonderful thing when they first dreamed up Chai! Anyway, while the tart is baking, I place all the cores and peels from the apples and bring it to boil with little sugar and water. It caramelized till pretty thick. Seeing that there's not much of sheen in Deb's tart, I added a little apricot preserve into the apple syrup and brush that all over the baked tart including the crust of the tart. Serve a slice of this warm tart with little balls of the Chai Ice Cream and close your eyes, eat and savor every bite and mouthful! You're already in heaven! If you guys did follow my other frozen treat postings on PerfectScoops, you'll know that I've quite a fair amount of dry chocolate cake left from making Cappuccino Ice Cream Cakes. They are crumbly, not sweet but very chocolatey. I've turned them into these little cake pops. They are so easy and I don't even need a recipe! Of course, the concept itself was introduced by the infamous Bakerella here. But I don't have time for all the artsy fatsy stuffs with Christmas deco and Easter theme. I need these quick for a drink party night in Adrienne's place. So embarrassed to say we arrive exceptionally late because Aaron was working night shift that day. But I know these cake pops wow-ed the crowd and totally make up for our lateness! Some tips I'd like to share with you all. Aunty Yochana uses a bucket of uncooked rice to let fondant on her cookies dry out. But you need long and many wooden skewers for that. Bakerella uses styrofoam boxes which could be hard to come by and sometimes, prices could be rather steep. I don't even have lollipop sticks! All I did was to cut each wooden skewers in 4 short pieces and use that as my lollipop sticks. I let them semi-dry out on a colander. All you really need is a colander! Look at how beautiful it works. Pardon the picture above. I took it last night while trying to show you how easy a colander can support all your cake pops. I brought all over to Adrienne's palce and save 8 for us. As for recipe, all I did was to defrost the frozen cake in the microwave. Pulse them until very fine in a food processor. Add enough ganache (1 part cream to one part chocolate) to bind them together. Then use a melon baller (yes, my melon baller is so versatile and has served me for a good year and many more years to come!) to get even shapes. Roll them lightly in between my palms. Push a wooden skewer through the centre of each and freeze it while I quickly clean up my kitchen counter for the next step! I find microwaving chocolate will not work here. You need flowy chocolate to coat and really, melting chocolate ala Bain-Marie not only gives you glossy chocolate but they stay melted for quite sometime even after you turn off the heat. So coat the cake pops in good quality melted chocolate (Homebrand chocolate chips just wouldn't work, I've tried!) and let it semi dry, suspended on the colander. Work with 10 cake pops at one go. For coatings, I've used dessicated coconuts, 100's & 1000's and toasted crushed pepitas, just for the colour and contrast. I left some plain because by the time I want to roll them in the coating, they are all fully dried and as hard as rock. Oh well, I get 4 variations then, no complain! I made approximately 28 cake pops so you could imagine how messy kitchen was. Thanks to my manual dishwasher, I can quickly go shower, catch a quick dinner and spend the night in Adrienne's place, catching up, sipping on Irish Cream liqueur, awesome! Will I make a chocolate cake and smash it just for this? NO! Leftover chocolate cake with buttercream frosting or ganache works fine too, I've tried it before. It's very versatile and looks cute so make some today! All about plating up Tiramisu Verrines! Had about 1/2 cup of Mascarpone left in the fridge from making Bailey's Ice Cream last night. Couldn't resist making tiramisu. After all, it's been a long time since I last made one. This time around it's a little different. I wanted something more dense and rich with Mascarpone and sabayon only; which means no cloying cream in this one at all. And I'm getting sick of accumulating too much egg white so I use one whole egg and decided we could do with egg white foam. Yes it's raw buy my egg is dead fresh. I got it off the shelf and they just came in today. I don't rear chicken at the back of my house so this is as fresh as I could get. Heck, so be it! I decided to play around with the plating this time. I estimated I would probably yield 4 verrines so I took out a couple of glasses I would like to present them in. I also separated the layers. Quinn: Speechless.....Heck, yeah, it is Tiramisu Sam! I don't know what was I thinking but at that very moment, I didn't thought it was Tiramisu after deconstructing them. I don't know whether people do deconstructive plating for Tiramisu but I thought they look fine to me. Next up, I quite like this one in Martini glass I would say. I thought they look like butterfly with wings spread open. It's really easy. I just simply soak the sponge fingers in the coffee and place them in the glass, leaning against the wall of the glass. Dollop a little Mascarpone and swirl in the Sabayon and finally, finish it off with a dollop of egg white foam and thoroughly dust it with cocoa. Yes the Mascarpone was rather thick and creamy so it is totally alright if you wanna add in a little whipped cream to loosen up the stiff cheese a little but I wanted a cream-free tiramisu this time around. It' s really very flexible so just do what you like! I hated this one below the most really. One flaw, it would have looked way so much better had I broken the finger in half. There's just too much sponge finger protruding from the glass, not to mention I accidentally bought the jumbo size one so they look really clumsy! It's all Aaron's fault. He's weird, he likes the fingers a lot he could eat them plain. He kept saying he wants more finger base and less creamy mixture so this is totally meant for him! Finally, when you are about to clean up and are down to the last one, simply mix and scrap everything into one big bowl and whisk them into submission! Everything includes foamy egg white, Sabayon and Mascarpone! Soak one or two or three (Aaron is crazy!) jumbo fingers in the remaining coffee mixture and smashed them up to bits. Layer them into a large champagne glass, starting with a crazily thick layer of fingers, followed by filling and a generous dusting of cocoa and repeat another two or three layers like me if you're trying to stuff everything in a final verrines! Not like I complain licking them off the spoon or whisk. It's just that it is a rather warm day so everything was pretty much at room temperature rather quickly. It obviously doesn't help with the egg white foam turning watery faster than I could put up all verrines together and snap all these shots to share with you! Am I superb or what, you tell me! And yes, I prefer licking them off whisk if they're very well chilled. The eggy taste was quite dominant when it's at room temperature. Perhaps, there's just way toooooo little sugar in there. I didn't wanna mask the excellent creamy texture with sugar you see so I might just omit the egg white all in all next time! A little is good but too much is not. Note, only the verrine where I stir everything together has a strong eggy taste. For the rest, a dollop of foam goes a long way i terms of taste and elegance! Whisk the above over Bain-Marie. Having experience these, I can quite confidently tell you people to turn on the heat to the maximum and whisk like mad dog for 5mins or so. It thickens up instantly and when freeze for 10mins, it's the perfect consistency. Thick, gooeey, ribbony and all that you want in a Sabayon cream! Combine the above together in a large shallow dish. Stir the Mascarpone in a large bowl until it's softened and smooth. Fold in the whipped cream if using. Assemble everything in separate layers into tall glasses and serve. Use as much sponge fingers as you like or when you ran out of coffee, you know it's time to stop dipping more! Enjoy Tiramisu in a whole new way! As big as this loaf of bread might look, it is in actual very very small.... This Hokkaido Milky Loaf made famous by Angie uses only cream and no butter and yet the end result is soft and fluffy. You are still not convinced it's small do you? Well, I've made one-fifth of the recipe and bake it in a 6'' x 3'' x 1.5'' loaf pan. You go take a ruler and do the maths yourself! This is specially requested by Sammi, my housemate. She must have been dying to try Hokkaido Milky Loaf for ages. Sammi....if you're reading this, you can now rest in peace now since you've tried this infamous loaf! I didn't want to glaze the top of the bread with egg wash nor milk. I want this to look classical yet elegant and rustic. I've dusted the top of the loaf with bread flour liberally before popping it into the oven. Pour the wet ingredients into the dry ingredients and knead away as you would do to a normal loaf of bread until it pass the window pane test. It's really a small dough and you'll achieve that membrane stage in no time! Form a smooth ball and place it into a grease unreactive bowl, seams side down and cover with a damp cloth. Let rise until double in size or pass the finger test. Divide them into 4 very cute looking portion. Roll them into rounds and cover and let rest 20mins. Now, roll them up into a long oblong and roll them up tighlty, swiss roll style. Repeat for the remaining three balls and place them into a greased loaf pan of dimension 6'' x 3'' x 1.5''. Let it rise until it's almost peeking through the top of the loaf tin and throw them in a preheated oven. A good 20mins later, baking at 170°C, your mini loaf is done! Serve warm, plain, buttered, slapped with peanut butter or kaya or anyway you like to! Remains soft up to 3 days and truly tested bu truly yours. There's only one slice left in the kitchen now, I doubt it'll pull it through tomorrow really with Aaron around! Have fun making things in mini form! I'm back and exams are over!!!!! I am a free person now. 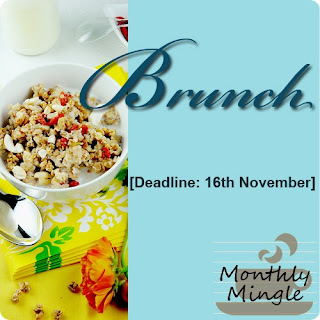 I'm glad I made it in time for this month's Monthly Mingle themed Brunch! At first I wanted to make a 'brunch with crunch' just so it rhymes. I thought of granola, weet-bix, roasted pecans and something to do with lavender. Sounds like a good combination but I just finished my exam so please spare me some time from recipe developing and being creative. All I need is a quick fix and yes, I have very sweet tooth to have chose this Condensed Milk Pound Cake by Pichet Ong as my brunch. I top it with a generous scoop of vanilla gelato. It totally paired well with this fusion and very vanilla pound cake. Everything is vanilla about this brunch. The cake uses vanilla sugar and vanilla bean and the gelato contains just simply 3 ingredients and you could make it in no time, plain whole milk, vanilla sugar and vanilla bean paste. Hop over to my other frozen treat blog for recipe! While I like how rustic pound cake look with a long crack on the cake surface, I do not want them here this time around because I want a flat smooth surface to do this top view picture for you all. I kinda like doing bird's eye view shots nowadays because it shows everything I need to show you in one shot and the ample sunlight nowadays nearing to summer gives it a perfect finish without any editing needed. I made a very small loaf with this and fill up the rest of the batter to make 3 medium sized muffins. I have only made two-third of the original recipe because I've only got exactly 1/2 cup of condensed milk left. I like Pichet Ong. I can't believe I have his book around for so long and never make anything from his book. I am too obsessed with Tessa people. I'm currently very into her fourth book, Piri Piri Starfish. A lot of cooking requiring chourico but I've substituted with chorizo and they're equally as good too. I so need to update my CookingQuinn I know! This book by Pichet Ong, it's called the The Sweet Spot. The picture at the front cover, it's a Sake-Sauteed Plums with Ginger and Star Anise is so so so alluring and all the recipes are definitely intriguing with a twist of Asian in it. Duhhh.... it says Asian-inspired desserts at the front cover too. CHEF’S TIP: This pound cake keeps well, tightly wrapped, for up to 1 week at room temperature or up to 2 months in the freezer. Preheat the oven to 325°F/ 165°C. Generously butter an 81⁄2 × 41⁄2-inch loaf pan and set aside. Sift together the flour and baking powder and set aside. Put the sugar and the chopped vanilla bean, if using, in the bowl of a food processor fitted with the metal blade and pulse until the vanilla bean is finely ground. Sift through a fine-mesh sieve and return the sugar mixture to the food processor. If not using the vanilla bean, just put the sugar in the processor. Add the butter and salt and process until light and fluffy, about 2 minutes, scraping down the sides and bottom of the bowl occasionally. Add the condensed milk and pulse until well incorporated, about 15 times, scraping down the sides of the bowl once. Add the sifted dry ingredients and pulse until no traces of flour remain, about 10 times. Add the eggs and pulse just until combined, about 5 times. Scrape down the sides and bottom of the bowl, add the vanilla extract, if using, and finish mixing by hand to fully incorporate the eggs. Transfer the batter to the prepared loaf pan. Bake until the top is dark golden brown and a tester inserted in the center comes out clean, about 1 hour. Cool completely in the loaf pan on a rack, then unmold. Slice it up and serve with either macerated berries or Creme Chantilly or just top it off with a scoop of vanilla gelato and serve it at anytime of the day! Thanks Meeta of What's for Lunch Honey in organizing this monthly event. Love the virtual party!